I’m guilty for sending things to committees to die. Here’s how to survive and make it productive. Here’s a great article by ECHO. 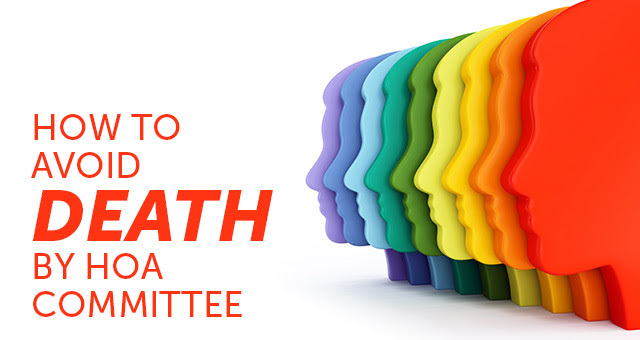 Committees are a powerful tool for HOA boards. Used correctly, committees allow associations to work efficiently, build trust, encourage member participation, and make use of multi-talented community. But some committees are a disaster. HOAs occasionally shuttle projects off to a committee where they languish and die. Poorly functioning committees anger owners, frustrate committee members, and do nothing for the board. Create a committee charter. Charters give committee a firm structure, and provide the members with clear expectations and limits. Pick the right people. Not every problem belongs in a committee, and neither does every person. Learn how to choose the right people. Say thank you. Committee volunteers can be invisible. Be sure to publicly appreciate their hard work if you want to grow a base of committed volunteers. Give the committee a clear purpose. Is the purpose of the committee to provide the board with a recommendation on an issue? Is the purpose of the committee to carry out a specific task? Tell the committee what you expect them to produce. Is it a detailed recommendation to the board? If so, what must be included in the recommendation? Will the committee take some sort of action on behalf of the board? If so, be very clear about the action the committee is expected to take, and establish clear limits. Remember that a board may delegate authority to act, but cannot delegate responsibility for the action. Tell the committee how long their services are needed. Is the committee to meet during a period of six weeks or a year? Is the committee a standing committee that will meet until the governing documents are amended or until the board takes action to dissolve the committee? If the committee will need money to fulfill their charter, be clear about the amount of money available to the committee. You should also be clear about the process the committee should go through to obtain the funds. If the committee is not being provided with funds, tell them. Establish how the committee should report to the board. Committees making recommendations or decisions must communicate their findings to the board. Be clear about the frequency and method of those reports. Decision-making committees must produce minutes. HOA owners have a wide array of talents – a clear resource for the board. But each person also has a different levels of energy and skill, along with a unique agenda and temperament. Boards must balance each of those elements when they select the members of a committee. Boards should seek out people with important skills: CPAs for the budget committee, landscape architects for the landscaping committee, and natural leaders as committee chairs. But avoid placing a destructive personality on a committee – even skilled ones. Vocal owners with a clear agenda are not necessarily destructive, and may bring energy and focus to the committee. But individuals whose disposition will prevent the committee from functioning or will ignore the committee charter are not good candidates. Boards may also wish to appoint a “board liaison” to attend committee meetings periodically. The liaison can provide helpful background information to the committee, and can help the committee stay on track in the early stages. However, the liaison should be careful not to dominate or take over the work of the committee. Open or Closed Committee Meetings? For committee meetings, the Davis-Stirling Act does not require notice, posted agendas, minutes (except for decision-making committees), or open attendance. However, committees should not be used inappropriately to hide information from the membership. Committees with decision-making authority (such as architectural control committees) should give notice and hold open meetings. Committees may also periodically seek out input from the community. And if the committee members contain a quorum of the board, the meeting is subject to the provisions of the Open Meeting Act. Disciplinary committees (sometimes called “rules committees”) should not be open to members, even if they have authority to enforce rules; members have the right to preserve their privacy in certain circumstances. Similarly, advisory committees who are conducting research and working on a recommendation for the board should not be compelled to have open meetings. However, recommendations to the board should be communicated and discussed at an open board meeting. Say thank you! Recognition and appreciation for a committee’s input and hard work will lead to successful committees and enthusiastic members. Don’t overlook the effectiveness of a simple thank- you note, an acknowledgment in the community newsletter, or a plaque presented at an annual meeting. Committees whose contributions are acknowledged are more willing to give their time and effort to their association.